2018, Lower East Side Festival, NYC (excerpt). 2016, Buffalo Infringement Festival, Buffalo, NY. 2016, Loyola Marymount University in Los Angeles. 2015, Brazen-Faced Varlets, Buffalo, NY. 2014, Oxford Community Area Community Theater, Oxford, OH. 2011, Fresh Fruit Festival (Off-Off Broadway), NYC. 2010, Nominated for "Drama of the Year," New Orleans Marquee Award. 2008, Published in The Second Coming of Joan of Arc and Selected Plays,Outskirts Press, CO. Break the Mold Productions, Marigny Theater, New Orleans and Venus Theatre, Laurel, MD. 2003 Bakehouse Theatre production in Adelaide, Australia, starring Jacqy Phillips. 2005 Vagenius Productions, San Antonio, TX. 1998 Wright Productions, Winters, CA. 1998 Campfest Women’s Music Festival, Oxford, PA.
1997 Wright Productions, Apache Junction, AZ. 1997 Women in Theatre Festival, Eugene, OR and Roseburg, OR. 1996 Wright Productions, Northern California tour (Willets, Ukiah, Sebastapol, San Jose). 1995 River Moon Productions, Santa Rosa, Santa Cruz, Sacramento, Eureka, CA. Published in Performing Autobiography, ed. Lynn Miller, Univ. of Wisconsin Press, Madison, WI. Featured performance, QueerFest, Los Angeles. 1996 Featured performance, Nat’l Women’s Music Festival, Bloomington, IN. National Winner of $3000 Arch and Bruce Brown Foundation Grant. Excerpts featured at the Sisters on Stage Lesbian Theatre Conference, NYC. Broadcast on QTV, Santa Cruz, CA. “A tour de force… Magnificent… beautifully crafted script...” --Advertiser, Adelaide, Australia. “Electrifying… enormously entertaining, absorbing, and brutally honest… Anger, pride, frustration, flair, narcissism, nastiness, grandeur, passion, indomitable skill, jealousy, razor-edged revenge and ultimately heart...” --Sunday Mail, Adelaide, Australia. "I almost never review something that a viewer can't see – such a show that's played only a few performances and closed. There are exceptions, however... Last week, at the Marigny Theater, I saw a one-woman show, The Last Reading of Charlotte Cushman, that is simply extraordinary and if there's any justice, it will return there or somewhere else... Karen Shields gives a beautifully modulated performance: moving, poignant, terribly theatrical and funny as hell...superbly structured, a showcase for a strong, dynamic actress..."-- David Cuthbert, WYES-TV, (PBS affiliate), New Orleans. “Never have I heard such raves from so many of our festi-goers… clearly the highlight of the… National Women’s Music Festival!”---Mary Byrne, producer National Women’s Music Festival, Bloomington. “… nearly flawless in its appeal and execution… [Gage’s] Charlotte brought an appetite to the audience they didn’t even know they had… the audience reluctantly left the theatre...” --The Slant, Marin County, CA. “… flawless… a smashing performance...”--We the People, Sonoma County, CA. “… unabashedly lesbian, unabashedly theatrical...”--The Maui News, HI. (About Shields production) "To see this woman on stage...I can't even describe it. She has comedic timing that serves the writer's levity in a way that can only be experienced first-hand. And, when she steps into the classical monologues, the earth shifts a little. Her drama pulls up tears from the gut. It's incredible. Especially in the immersion theatre environ." -- Deb Randall, Venus Theatre, MD. The play opens with an announcement that the performance will be canceled, but Charlotte, outraged that such a decision has been made without consulting her, charges on to countermand the order. Cushman, struggling desperately against breast cancer, insists on performing—and, taking up the challenge of her condition, devotes the evening to the subject of death in the theatre. Having played many roles which require dying, Charlotte regales the audience with moving—and sometimes hilarious—scenes from Macbeth, Hamlet, Oliver Twist, A Midsummer Night’s Dream, Henry VIII, and the notoriously bad melodrama, Guy Mannering. 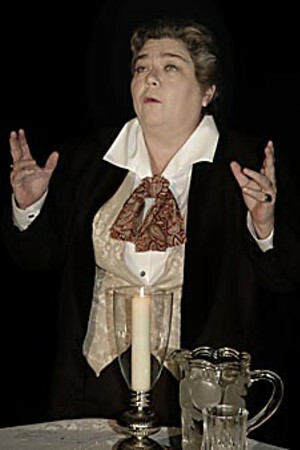 Interspersed with her monologues are anecdotes about other actors, her family, and about the romantic intrigues of the lesbian community of American emigrees who were living in Rome in the mid-1800’s. This community included Harriet Hosmer and Emma Stebbins, both sculptors of international reputation. At the opening of the second act, Charlotte shares with us an unusual bet she has made with her lover, who is watching from the wings. Later, as she performs her most famous “breeches part,” the role of Romeo, the play takes a surprising turn to reveal the woman behind the mask. The Last Reading of Charlotte Cushman is a treat for lesbians, for women’s history students, for theatre history buffs, and for fans of Shakespeare! But it is Charlotte Cushman’s profoundly human struggle against a terminal illness which makes the play an unforgettable experience. "Kind Words", Blog spot that cites David Cuthbert's review of the Break the Mold Production in New Orleans, Jan. 2010. "The Last Reading of Charlotte Cushman", reviewed by Dalt Wonk for The Best of New Orleans.com, Feb. 1, 2010. "Jacqy Captivates as Cushman", Eastern Courier Messenger, Adelaide, Australia, Nov. 19, 2003. "Voices Made Flesh reviewed by Tanis Macdonald, in Canadian Literature: A Quarterly of Criticism and Review, Vol. 186, Autumn, 2005. "The Last Reading of Charlotte Cushman: Bakehouse Theatre" reviewed by David Grybowski for dB Magazine, November 29, 2003.